Rob Gronkowski celebrates during Super Bowl XLIX at University of Phoenix Stadium on February 1, 2015 in Glendale, Arizona. The 29-year-old played nine seasons with the New England Patriots after he was drafted out of Arizona in 2010. 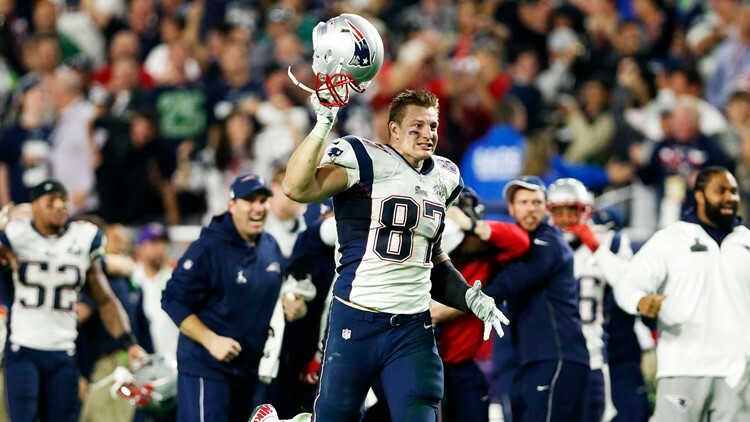 TUCSON, Ariz. - New England Patriots tight end and former Arizona Wildcat Rob Gronkowski announced his retirement from the NFL via Instagram on Sunday. "It all started at 20 years old on stage at the NFL draft when my dream came true, and now here I am about to turn 30 in a few months with a decision I feel is the biggest of my life so far. I will be retiring from the game of football today," Gronkowski wrote, in part. Gronkowski played nine seasons with the Patriots, helping the team to win three Super Bowls. He was drafted in the second round of the 2010 NFL Draft out of Arizona, where he owns the school's single-game, season and career records for receptions, yards and touchdowns by a tight end. In his NFL career, he saw more than 500 receptions and 79 touchdowns. He earned Pro Bowl honors in five seasons and was a First Team All-Pro four times.